The Bay Area has long been a skateboarder's paradise, wooing more kids with its concrete surfaces than with its baseball fields. Now Berkeley has built what many locals call the best new skate park, just a BART trip away from downtown San Francisco. The park's double bowl, horseshoes, hips, and street course make it an ideal spot for dedicated skaters and newcomers alike. The only problem is the chain-link fence surrounding it, and the locked gate. 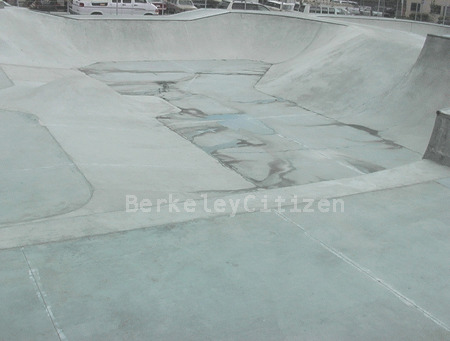 The park, which opened Sept. 15 to streams of skateboarders and can accommodate up to 200 a day, closed suddenly Dec. 24 when Berkeley's Parks, Recreation, and Waterfront Department crews found the bottom of the double bowl filled with groundwater. Lab tests soon revealed the water contained toxic amounts of hexavalent chromium, also known as chromium six. With Berkeley's children rolling, flying, and eventually falling all over the concrete park, the question is not why the park closed, but why it opened in the first place. The recent discovery of toxins at the site was not a complete surprise to city officials, who knew as early as 1989 of chromium six leaks from the nearby metal-engraving company, Western Roto Engravers/ColorTech, at Sixth and Harrison Streets. "We tried a very passive method of remediation," says Nabil Al-Hadithy, Berkeley's Toxics Management Department's hazardous materials manager. Although WRE/ColorTech has spent more than a million dollars trying to neutralize the problem, Al-Hadithy says, "they have not been as aggressive as others." But Bill McKay, WRE/ColorTech's general manager, says his company originally went to the city when it discovered the situation in 1989 and has been vigilant ever since. "It is Western's fault," McKay says, "but the city shouldn't have let the crews dig at that depth." In 1999 crews from skate-park construction company Site Design Group began digging the deep bowls that would make the park a local favorite, but they were forced to stop when they went below the water table and encountered a plume of water containing toxic levels of chromium six. At that point the city had to choose between scrapping the plans altogether, finding a better site, and engaging in a costly and time-consuming detoxification. The city wants to save the park, so it enlisted the help of two environmental engineering firms, the state's Department of Toxic Substances Control and the San Francisco Bay Regional Water Quality Board. Chromium six got its big-picture debut in Erin Brockovich, in which Julia Roberts portrayed the unlikely real-life victor in a battle against Pacific Gas and Electric Co. when the utility contaminated a small southern California town's drinking water with the known lung cancer-causing compound. L A Wood, a local environmentalist, has battled the Berkeley City Council and parks department since the park was originally proposed in 1999. "The city was not practical; containment doesn't work when it comes to hydrology," Wood says. "They knew they could not build a subsurface structure." However, others involved with the current dilemma are more optimistic than Wood is when it comes to the future of the skate park. Mark Seleznow, the deputy director for Berkeley's parks department says the goal is to get the park open again, hopefully under better circumstances. "It caught us all by surprise, but that's why we're being so cautious this time around," Seleznow says. Dr. Norman Ozaki, a specialist in human health and eco-risk evaluation with SOMA Consultants, would not comment on specific details of the current health-risk assessment, but says he feels confident the park will be open again. With the skate park in limbo, Wood has found a new focus for his energies in the Harrison Street corridor. East Bay homeless-advocacy group Building Opportunities for Self-Sufficiency has drafted plans for a transitional-housing village located next to the closed park. Even though plans for the housing project are in the early developmental stages, Wood already has objections. "This housing project raises the issue of environmental justice as perhaps no other property in Berkeley," Wood states in a letter to Wendy Cosin, Berkeley's deputy planning director. BOSS's project developer for the Ursula Sherman village, Daniel Barth, is not backing down because of Wood's concerns and says he feels the needs of homeless people trump those of environmentalists. "Environmentalists' concerns are small when compared to housing," Barth says. "When they're doing their job, they sometimes hinder other issues." Steve Barton, head of Berkeley's Department of Housing, says the city is concerned with the site but at the same time understands BOSS's point of view: "It's not an ideal site, but I'm inclined to think that unless something more serious shows up, we should get people off the streets." Meanwhile, skaters like John Schaub will have to wait for the health-risk assessment to be completed before the city makes any further decisions. "I think it's sad how they did it, knowing full well the situation with the chemicals," Schaub says. "The chances of it opening under these circumstances seem unlikely."